Discussion in 'Forza Horizon 4' started by GTPNewsWire, Jan 21, 2019. 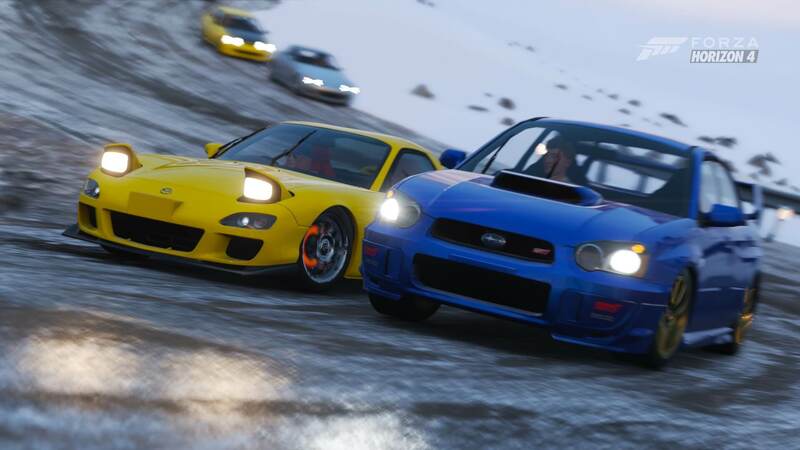 This article was published by Michael Leary (@Terronium-12) on January 21st, 2019 in the Forza Horizon 4 category. I didnt know you could dance in this game. Not really fussed in my opinion. Nice, now just remove every other dances. CSLACR, FireEmblem10, Gerarghini and 14 others like this. I'm just curious as to how a dance can be considered copyrighted property, and how to actively enforce said copyright. That'd be like the Jackson estate suing someone every time they do the dance from Thriller. Just like these other performers, Horning does not own the copyright to his dance — a very important and difficult step in claiming ownership — but has filed for it. Jackson family suing would make more sense than whatever this is because that is actually an individual dance routine created for that song. The Carlton is likely just some stupid random cheesy dance he did on the spot to fill a roll. All this looks like is a cheap way to try to make a buck. Victoria H and Blackdog8 like this. AFAIK he wasn't the creator of the dance either. That's what has me most interested about this case, and why we've run with the article. The main argument in Fortnite's case seems to be that the emotes can be purchased individually with real money (I think; I don't play it and have no intention to). That's not the case with FH4 since there's no microtransactions, so one would have to make the argument that the game's sale itself is "making money off the intellectual property"... except like you said, I'm not sure how anybody can copyright a dance move. except like you said, I'm not sure how anybody can copyright a dance move. I'd imagine that it depends whether it is just one move (I guess an example for that would be the moonwalk) or if it is a whole choreography (like the Floss dance). Pretty much like music, nobody owns a key like G minor but if your song sounds just like Smoke On The Water, you'd probably get into legal trouble. On the other hand, if you sampled it and gave the track away for free, you wouldn't get any money out of it and you might just get away with it. You could even say you paraphrased it in the article as "All recreated logos or real-life likenesses of any kind are the result of abstract shapes and patterns." I don't understand how an actor on a TV show can lay claim to a copyright claim on a dance that was performed as part of a television show. Isn't the ownership of said dance the property of the shows creators? Does anyone think that the actor who plays Sheldon on Big Bang Theory gets royalties for people using his catchphrase "Bazinga" on T-shirts or Mugs. I would think that the owners of the show licensed the use of the word for sale on goods and not the actor who said the catch phrase. If I work for a company and design a new product while working for that company, using company materials and time, my company would let me know that the product belongs to them, even if it was solely my idea. I don't understand how an actor on a TV show can lay claim to a copyright claim on a dance that was performed as part of a television show. In this case, I believe he claimed the dance was improv and not part of the script. So the performance itself is, technically, his intellectual property. The issue with Fortnite is both the monetization of the dance and the fact that they specifically copied his original performance. If I work for a company and design a new product while working for that company, using company materials and time, my company would let me know that the product belongs to them, even if it was solely my idea. This would most likely be written into your employment contract. mef and Gerarghini like this. Actors must have much better contracts that computer programmers. Many programmers basically sign over the rights to anything they code while employed with a company, whether they were directed to program it or not. Ribeiro has previously, publicly admitted that he got the Carlton dance idea from a friend of his. But script aside, wouldn't something done by a character on a show, be owned by the show? What's to stop Ribeiro from demanding compensation for the dance in any episode it shows up on, now that the show is in syndication? If the show doesn't own the dance, I don't see why he couldn't. Actors improvise in TV shows and movies all the time, and I've never heard any legal argument that the origin of the performance affects the legality of who owns it. Ribeiro is simply grifting - hoping Epic will just toss him some settlement money to be quiet and go away. Playground are being cautious in the interim. Telling that Destiny 2, which also has the Carlton dance but is far less successful than Fortnite, never got sued. I don't know enough about the origin of the "Floss" to say anything about it. No real loss there, they can take the dab as well while they're at it. Mind you, this decision is concerning in of itself, making the subject of this video, a very real and scary reality for racing gamers. Skip to 11:21 for my main point. What's to stop Ribeiro from demanding compensation for the dance in any episode it shows up on, now that the show is in syndication? He is being compensated through royalties, no? And you're kind of ignoring the possibility that Ribeiro might have given the show permission to use "his" dance in the first place. I've never heard any legal argument that the origin of the performance affects the legality of who owns it. Things like this happen all the time. This was just the biggest in recent memory. Destiny 2, which also has the Carlton dance but is far less successful than Fortnite, never got sued. Probably because the dance wasn't a frame for frame copy in Destiny 2. Just curious btw... what happens to people (not me) who had Carlton or Floss enabled? Does their avatar just stand around instead, scratching his or her arse or something? He can say what he likes, but the fact is he stole it from Courtney Cox from the Bruce Springsteen video she was in. So she should sue him. Lets not forget he got his big break by impersonating Micheal Jackson. I mean it's possible, GT Sport itself had a Lotus Evora in the beta, but not in the final game. Forza games have been removed from digital storefronts 4 years after release, so that's the cut off line for T10's games when the licensing expires, but you can still get a physical copy. I don't understand how an actor on a TV show can lay claim to a copyright claim on a dance that was performed as part of a television show. Isn't the ownership of said dance the property of the shows creators? Stuff like that is determined by how the employment contract is written and is not at all automatic, and considering Ribeiro almost certainly gets royalties from The Fresh Prince anyway he wouldn't be apt to sue NBC based on the episodes of the show itself using the dance. Having had the Carlton enabled, that's exactly what happens. Your avatar just stands there looking clueless and doing nothing. But show royalties would just be standard for his role in the show. If the show has additional IP in it that isn't owned by them, he'd be 100% within his rights to sue for additional compensation. This is all academic anyway - he almost certainly doesn't own the "rights" to it, and while you can own dance "routines", you can't copyright a simple move. Nor has he to date, for that matter. I hope he goes down in flames, and gets hit with court costs for Epic. And I've actually met the guy before - he was racing go karts downtown where I live years ago. If the show has additional IP in it that isn't owned by them, he'd be 100% within his rights to sue for additional compensation. Unless he already gets it. Being one of the most recognizable elements of the show and frequently used in advertising for syndication, it's entirely possible that that is something that was worked out by him with NBC. I hope he goes down in flames, and gets hit with court costs for Epic. That's a fair enough view, but considering a good portion of the additional stuff I've seen that Epic sells is deliberately as close to copyrighted material as possible so its obvious what it is supposed to be but without Epic having to pay anything, I can't agree. Oh I have no love for Epic. In my ideal world, the judge would somehow rule against them both and fine Epic for several hundred million dollars for... reasons. However, I hate frivolous, grifting lawsuits more, and Ribeiro openly acknowledges that a) he didn't invent it, and b) he has taken no steps to even try and copyright or trademark it. I don't play Fortnite so I can't comment on anything else they sell, but in this case I hope they win handily. The "Carlton", is just a move that was admittedly a copy/mix of Courtney Cox and Eddie Murphy. His quoted quote starts off saying that it's a copy of Cox, followed by then claiming it's a mix of the two and calling it "his own". Interesting how someone can admittedly copy someone's dance moves and then call them their own. Not that I was an Alfonso fan, but I actually have less than zero respect for him after this. UKMikey and PaulGrey like this.